...No - I don't mean the type of blossom that there is an abundance of here at the moment, in this glorious spring time! As gorgeous as it is, I mean Blossom the cow and she is one of my Auntie Pam's best friends! My Auntie asked if I wouldn't mind sketching her and I have just got around to doing it! At number one it is the wasp! Just typing the word makes my fingertips break out in a sweat! At number two it's the camel. I was once KIDNAPPED by a Tunisian on a beach and FORCED to ride one! ... Well... okay... maybe not actually kidnapped... let's just say, heavily persuaded - but 'oh the trauma'!!! At number three it's the COW!!! I was once chased across a field by an entire herd of cows! I must have looked like an out of control windmill with my arms and legs flying all over the place as I ran screaming hysterically towards the gate! I have never wanted to be anywhere near one since! So, would I have chosen to draw a cow? Absolutely not! I am told that she is a very friendly cow. On the subject of the things I am frightened of - you MUST check out Suzanne Berrys blog. Aside from being an incredibly talented Artist - she has recently painted some wasps that look so incredibly real! Real enough that I felt my heartbeat race the moment I saw them! Eek!!! Sandra, Miss Blossom is lovely. Bravo for taking on something that you fear. I was pecked by a HUMUNGOUS turkey when I was about three years old, so I empathize with your feeling. She is adorable! Look at those eyelashes! Ohh, Sandra I just love Blossom and you made her look like a beautiful movie star.. No I'm not afraid of cows, but then again remember I have alligators in my back yard !!! Sandra, this is such an incredibly lovely drawing! such character, she's just beautiful! your pencil work is amazing. and thank you so very much for mentioning my blog!! how kind of you! i appreciate it so much and am thrilled with your lovely compliments. i'm sorry the wasp freaked you out. he's certainly not as fuzzy and friendly looking as the bee. thanks again! Blossom is beautiful.Just perfect. Don't you just love cow eyes! This is very very good. The strokes are so clean and Blossom looks really cool too. Oh your story made me laugh because i thought i was the only weirdo who thnks cows are evil! I also got chased by them when trying to take a shortcut through a field on the wsy home from school many years ago and their big cow eyes don't fool me! That said, your cow picture is fantastic! Hi Sandra, this is such a beautiful drawing! Blossom looks so sweet.....impossible to be scared of her. Ciao! I would imagine that this is a heifer rather than a cow, as it is a Hereford - a breed grown for meat rather than milk production. I have to say that this is an incredibly good piece of work Sandra - her nose is especially life-like. Kudos for this one. As for being chased by a herd of cows, if you had stopped and turned around to face them, I would bet my last pound that they would all stop, because cattle are generally inquisitive rather than savage, and wanted a closer look at you rather than attack! If it were a bull in the field - a quick dash is in order! joke How do you tell a bull from a cow? Answer: Easy, one is two stone heavier! I am with you on the steer clear of the cow bit! My friend Pam and I did lots of walking through fields full of them and she seemed to laugh alot at me for walking miles around them!! 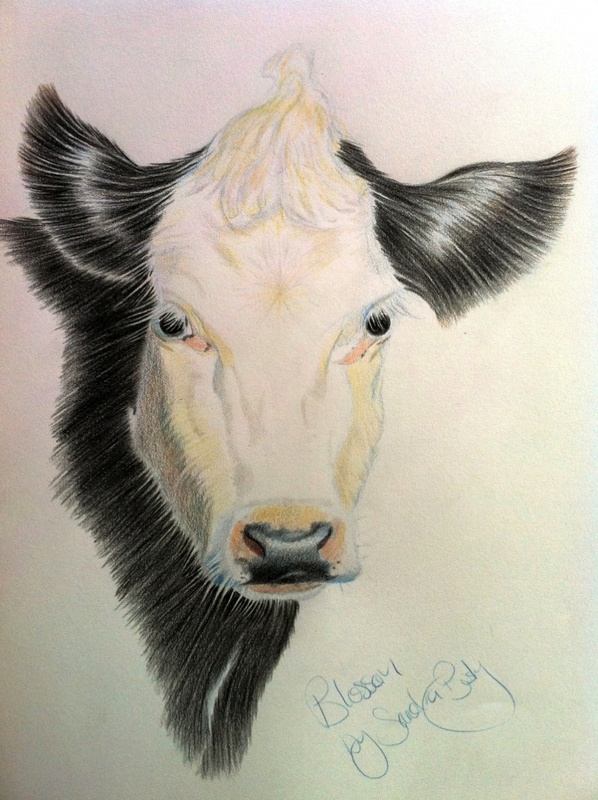 This cow is really beautifully drawn though! Blossom is gorgeous Sandra! You have shown such character in her. I was once chased and butted by a ram.... now, those I wouldn't mess with..... I had a bruise for weeks. I'd like to paint our indigenous cows sometime, the Inguni, as they have incredible markings. It is so lovely! You are very talented in drawing, Sandra! LOL, very funny post. My husband took the kids for a walk once, they climbed a fence (definite no, no) and several yards in were face to face with a bull who was pawing the ground. It wasn't funny at the time, but there was a lot of screaming and running and arm waving going on. I like Blossom, she looks more friendly. Holy Cow, what a great painting:) Love it!!! what a beautiful job, has such grace and tenderness that animal. Beautiful! You asked me if I paint a picture or natural. Alternate sections of paint sections of critical analysis. But never do both at the same time. paint a known location of memory or picture of the natural. But I prefer to recreate the marine landscapes of Rio de Janeiro using the most memory. This process is very enjoyable and has surprises even for me. I like both your cow and the story. You have made it look like a very kind and wise creature there. Beautiful work! Frank - Hmmm... And I always thought that a Cow is the mature female of cattle, a young cow was a Heifer and a Hereford was red and white...? I'd look it up if life wasn't too short, lol! Amanda - Thank you! It's odd that we both fear cows so much when we spent lots of time at the farm with Pam when we were little isn't it? Michael - Thank you very much! I used coloured pencils for this one which is something I hadn't used for some time. I'd forgotten how nice they are to use!